Steve Medanic, otherwise known as “MaDDman” here. In 1985 I created MaDD products which is now operated by REH and copied by everyone. In 2005 I developed the M-Magic electronic controller which has been hailed as the best HO controller, period. Some board members own a M-Magic controller. Others were on the “build” list when production stopped as the day job got in the way. Since then controllers have trickled at the rate of one or two per year. I am finally putting the M-Magic to bed and am announcing a new run of electronic controllers titled the M-Magic “S” controller. The M-Magic “S” controller will be an evolution of the final revision of the previous M-Magic (three dial/three switch) controller which is known in house as the “A-Spec”. The M-Magic “S” is a both simplification of and an improvement on the final version of the M-Magic controller. The M-Magic “S” is positive gate only as racer feedback has indicated that a dual polarity controller is not required. Deletion of the polarity switch reduces the internal resistance of the controller and allows more power to be provided to the car. 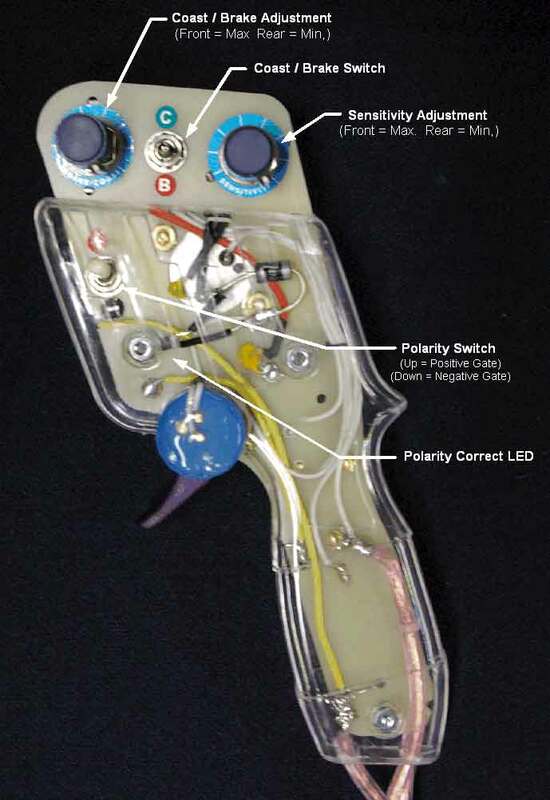 Three Position Choke (TPC) switch takes the place of the polarity switch. The TPC switch allows the user to change how the controller behaves when the trigger is fully depressed. In the up or Normal position the transistor is bypassed and full voltage is applied to the car. In the down or Half position the voltage to the car is reduced by approximately one volt. In the center or Off position the full throttle bypass is disabled and the maximum voltage provided to the car is controlled by the transistor in conjunction with the Upper Voltage Limit (UVL) dial. There is a third dial on the controller. This dial allows the user to adjust the Upper Voltage Limit (UVL) when the transistor is operating. Increasing the gap between transistor and bypass operation can make some cars easier more consistent to drive. The combination of TPC and UVL is amazing and racers have reported that the combination of TPC and UVL controls “tames” the gravity car. The sensitively dial continues to have a low and high range position switch. The low range is typically used for most cars. The high range is used for 12V cars such as the G-Jet or for high downforce cars with rewound motors. The “S” design reduces the overlap between low and high ranges by approximately 50%. Unlike the older controller separate thermal overload devices are provided for the coast and brake circuits. The use of separate devices for the two functions improves overcurrent protection for these circuits. The final feature is what I call Traction Control (TC). True traction control requires a computer and a DC current sensor. My circuit helps to prevent or reduce wheel spin when suddenly accelerating from stop or out of a slow corner. Testing has shown that a TC adjustment dial was difficult to use as it was easy to go too far and as a result go slower as oppose to faster. As a result, a non-adjustable TC circuit is provided. With the exception of the enhanced protection all of the features were available on the last revision of the “A-Spec” controller. I have updated several M-Magic controllers to the latest revision and will continue to do so if asked. Total production will be limited to thirty (30) controllers. Five M-Magic “S” controllers have already been sold. The controllers are hand built, and both left and right handed versions are available. As in the past, accommodations can be made for those with a unique way of holding the controller. PM me for additional information or to be placed on the waiting list. Creator of MaDD Products, the M-Magic and the new M-Magic “S” controller. When and how can get one? I sent a PM here in SCI this morning. I have one, and it is outstanding!!!!!! Excellent craftsmanship and operates flawlessly. I whole heartedly recommend one to anyone interested. Steve, did you make a couple of controllers for Tony Porcelli? Not sure that I ever made any for Tony directly. He could have picked one up but that would be rare. Here is a link to the Facebook page that shows a photo of the Left Handed prototype. Steve, thank you for your reply. A couple of months ago I had the opportunity to test and use two of Tony's personal controllers for about a week. The construction was top shelf and quite different in how the various knobs and switches interacted. I used them with everything from T-Jets to Poly-Mod cars and they were simply amazing, the best I ever used. The origin of the controllers was unknown. Your description of your controllers made me wonder if they might be of your design and manufacture. The final revision included the third dial. That was added after Tony passed. Steve, thanks for posting the photo. Tony's controllers where quite different. The current holder of them has no idea as to their origin. I behaved and took no photos or tried to diagram the circuitry. But they were very unique in design, function, and construction. Just finished fabricating the first 10 frames and heat sinks. The first 10 consists of nine RH and one LH. Assembly begins after Thanksgiving when parts arrive from the electronics supplier. There are still some spaces available on the list for those who want one. I have one of your controllers that I bought a long time ago and it's the best for sure. I would like to get a price on updating my current controller to current specs. Updates to the final A-Spec design are reasonable. I have done it to quite a few along with repairs and restorations. One owner was amazed when he sent a real hack job to me for an update and restoration. When returned, that controller looked brand new. It was not a "hack job". In your own words it was a "fossil". Which it certainly isn't now . Of course it is now officially labeled and called "The Fossil ".